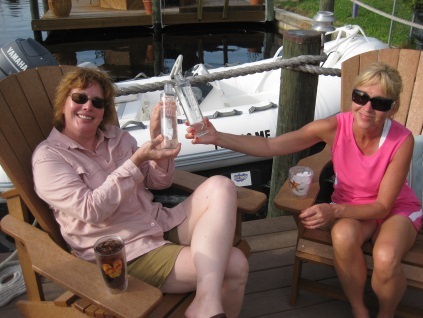 This story starts with a picture of a Norwegian water bottle taken at a private dock in Florida and ends with an impulsive purchase of a house in the same place four months later. When people from the northern parts of Europe get a taste of sunshine and warm climate year-round, something happens. In our case, after having lived two times in the lovely Brazilian climate, we started thinking about a warm place to spend our retirement years. While watching old people with walkers passing my kitchen window in Norway maneuvering on slippery sidewalks on their way to the grocery store during the wintertime, I asked myself: -Is this something to look forward to? Broken hips due to severe weather conditions sounded too depressing. When you have been working hard all your life, is this really the reward? Just two months before we moved to Rio de Janeiro for the second time, my husband called me from Florida and said: – I’ve just put in an offer on a house at Panama City Beach! To be honest, I froze; standing up to my ankles in saw dust after the contractors had finished their work at our summer house in Norway. -Are you crazy? I finally managed to ask. Fortunately we didn’t get the house, because there was a monkey-business-deal going on. However, it started a string of thoughts. Lars had been working for almost three years in Panama City, before we met, a great place on the Florida panhandle, with beautiful white beaches. That fall, we got a picture in the mail from Lars’ cousin in the US. We saw her and a friend sitting on a small, private dock drinking the fancy Norwegian Voss water, with palm trees in the background. I asked Lars where this picture was taken and he said: – Do you remember I told you that Susan’s friends have a house in Cape Coral? I remember he told me that they had a house in Fort Myers, but that name didn’t appeal to me at all. Cape Coral, however, sounded much more inviting! We contacted their friends and asked if they knew a real estate agent, because we would like to check out the area, on Florida’s west coast. We subscribed to Listing Book, the overall survey of houses for sale and got excited right away. 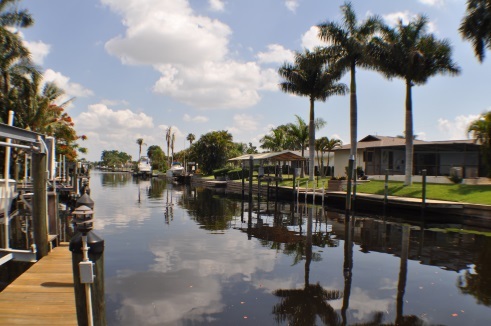 Cape Coral is America’s Venice, with 700 kilometers of manmade canals. You park your car in front of your house and dock your boat on the other side. We were calculating house prices, property taxes, insurance and everything else we could think about for months. In January we had planned a cruise in the Caribbean, Andrea’s and my reward for giving up our lives in Norway once again to follow Lars’ career. We flew up from Rio a week earlier than the cruise departure. Already the next morning we met the agent and looked at 13 houses. It’s kind of weird, because you usually buy a house in a place you’ve come to like, not a place you’ve never visited in your entire life. The next day we were down to three houses, the pink house, the bug house (no explanation needed) and the dog house. Most streets in Cape Coral have names like, SW 3rd Avenue, only the boulevards have names, so in order to remember the different houses, we gave them nick names. We zeroed out the pink house because of the location and decided to bid on the bug house. However, we gave the dog house a second chance. It got its name because of the two smelly dogs living there. The location was much better and it was across the street from Susan’s friends, who also became our friends. Moreover, the house was rented, which fitted us perfectly since we were living in Brazil, so I started to think how I could transform this house to be more like the bug house Aha! –We can make a bedroom out of the laundry room, which was quite big compared to the house’s size. It even had two windows. Then we could open up the wall from the bedroom next to the living room and get more light coming through. 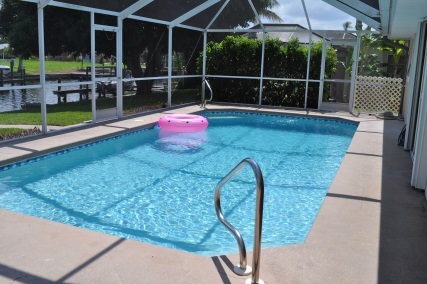 We agreed, bought the house – and five days after we arrived in Cape Coral everything was settled, even the technical inspection. After we entered the cruise ship we kind of collapsed! Buy a house and just forget about it? And what had we really done? Was this what we wanted and was Cape Coral a nice place to be? However, one month later we moved to Houston in one week’s notice and suddenly we were a two hours flight away. That helped! We visited the place several times and when the tenants moved out, we were ready to fix up the house. I can truly say I’ve never worked so hard in my whole life! Always in a hurry, I often left the house heading for the airport with paint stains on my face and hands. We carried through our plans and succeeded in creating our own tropical retreat! In November 2010 we rented a U-Haul truck, loaded it with furniture and things we had bought for the house and drove from Houston to Cape Coral, an 18 hours’ drive. A new and exciting chapter started! Luckily we have come to love this small town with the most amazing beaches and scenic canals. And our street has to be the greatest in the whole area, crowded with nice people. Almost every day at 5 pm our neighbors’ garage doors opens and we gather for a chat and a cocktail. I really must say that we’ve found our tropical paradise, even though it started with the picture of a Norwegian water bottle!